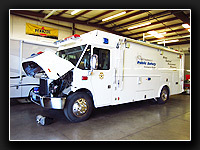 Full Service Chassis Repair. 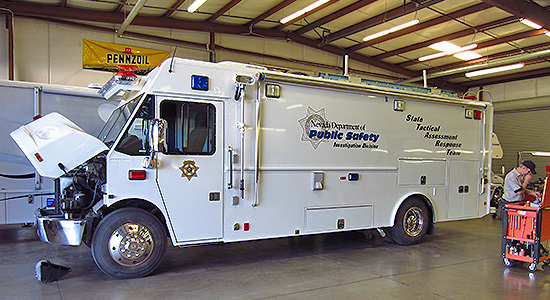 Large and Heavy Vehicles are a specialty. 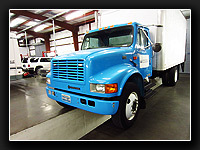 We specialize in large and heavy vehicles. 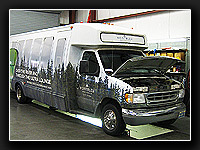 Brakes and Wheel Bearings, Suspension and Alignment, Tires, Alcoa Wheels, Batteries and Charging Systems. 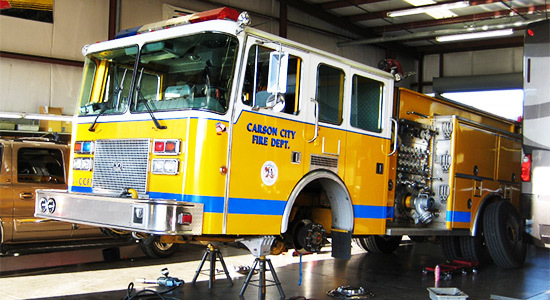 In this picture one of our local Fire Trucks gets Brakes, Front End Repair and Wheel Bearing Service. 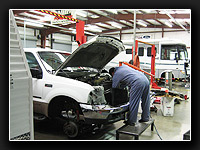 We cover all facets of diesel truck service and repair. We Service and Repair Engines, Transmissions, Radiators and Cooling Systems, Turbos and Inter-coolers, Fuel Injection Systems, Hoses, Mounts and Belts. To the Right, a Ford F350 6.0 Power Stroke Diesel engine gets some major engine repair including head gaskets, EGR and fuel system repair. Our Shop is always this clean. Always clean and orderly. You won't find dirt or grease on your carpet, seats or steering wheel after you bring your vehicle to us for service and repairs. 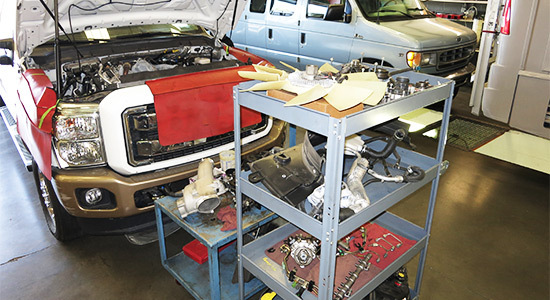 Left, a Ford F350 gets a new High Performance Inter-cooler and Exhaust System. We Service & Repair most Motor Homes & Trailers. No rig too big. 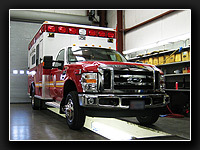 We specialize in top notch servicing and preventive maintenance. 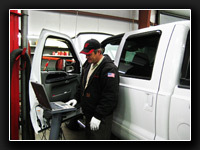 Our technicians do everything from oil changes to major repairs. 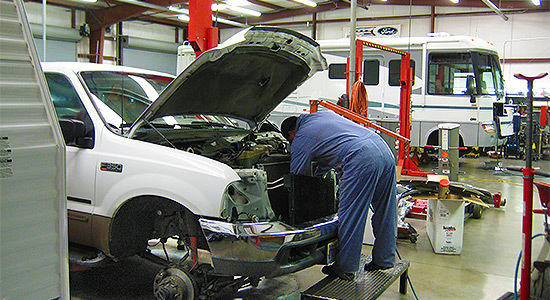 We have the parts, expertise, tools and equipment to do most mechanical repairs and servicing including Automatic Transmissions, Diesel Engines, Electrical Systems and most coach components. Exhaust Brakes, Turbos and Exhaust Systems. All installed and serviced here. We sell, service and install products made by Banks, BD, PacBrake and other manufacturers. If you tow a trailer or heavy load this is the best upgrade for you, it saves your brakes and makes driving more pleasant. We sell, service and install Banks Power and other fine performance upgrades for most Diesel and Gas powered Trucks, 4x4s and Motor Homes. 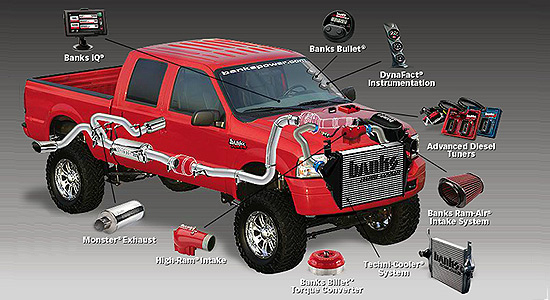 We have Air Filters and Intake Systems, Power Programmers, Exhaust Systems and Mufflers, Digital and Analog Gauges, Torque Converters, Exhaust Brakes and other products for Towing, Off-Roading and Pleasure Driving, These products add significant Power, Fuel Economy and fun to your vehicle. 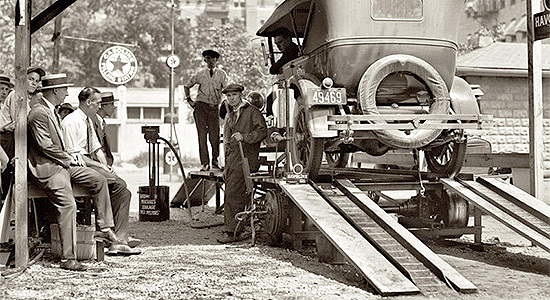 Complete Rebuilding Services for Autos, Pick Up Trucks and Motor Homes. 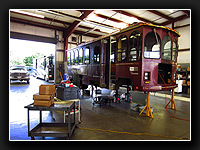 We offer complete system rebuilding services for autos, trucks and motor homes such as Engines, Transmissions and Drive-trains, Cooling Systems, Air Conditioning Systems, Brake Systems, Power Steering Systems, Computer Systems, Electrical and Electronics Systems. Many people, after seeing the price of a new vehicle are deciding to do a complete rebuild on their current one, getting a new lease on life and saving on insurance and registration costs as well..
Diesels and Water DO NOT get Along. 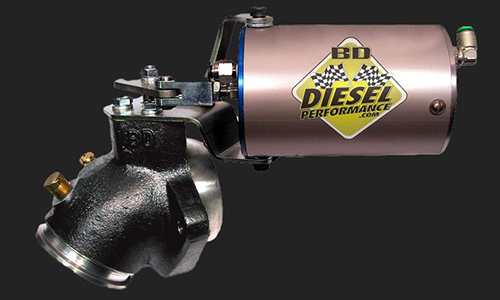 Changing the fuel filters in your Diesel Truck is just as important as changing the oil and oil filter. 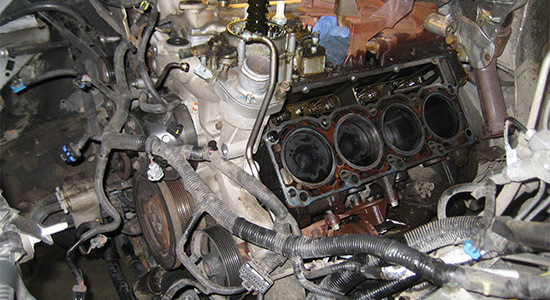 The newer model Ford Diesels, such as the new 6.7, do not tolerate any water in the injection system and catastrophic failure is the result (do a google search on Ford 6.7 diesel water in fuel). Plus, the stock filtration systems seem to be sorely inadequate. Also note that taking your truck to the Ford Dealer instantly VOIDS your factory warranty. Check and change your fuel filters frequently, and consider an aftermarket high performance filter system. Your Truck and your Wallet will thank you.